Everyone loves receiving presents – especially homemade ones! At Chistmas Easter or Valentine’s, gather your children’s cookery group together to whip up some delicious gifts. While some of these ideas are best carried out as a group, you can split the children into teams to roll, decorate and pack the finished results. Wrapped fudge, peppermint hearts, or traditional coconut ice – these homemade sweets, packed in a glass jar and tied with ribbon, make irresistible gifts. For peppermint creams, see below (you could make a pink variation sprinkled with gold dust!). 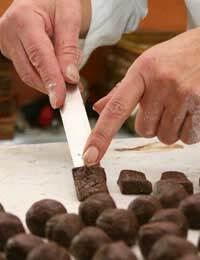 Fudge is an activity that revolves around a hot saucepan, so best undertaken in a small group with careful adult supervision. You’ll need sugar, butter and whole milk, a heavy saucepan and a food thermometer. When the fudge has been boiled, poured into a tray and set, let the children cut shapes and dust them with icing sugar or coloured sprinkles. The only thing left to do is wrap each piece in cellophane and pack into an airtight jar. These festive biscuits are made for hanging up, so you may want to double the recipe and give some out for your group to eat! If you fancied something different, what about stained glass biscuits? These traditional biscuits are cut in festive shapes and then have small holes cut from the centre. Slide onto a baking tray, and fill the holes with crushed boiled sweets. When they come out, the biscuits will have coloured ‘glass’ windows in the middle. Bake a big batch of cupcakes with your group and invite them to decorate... they could use thick icing swirled like snow, silver stars on black icing, or chocolate icing with a big red nose on the middle! This sophisticated chocolate treat is one of the easiest things you could make! There’s also lots of potential for imaginative variations – you could add orange juice, coffee, green tea, or almond essence to the basic mixture. Just make sure that the liquid you’re adding is strong and only add a very small amount at first. The basic blueprint is melted chocolate and double cream, warmed and stirred to thicken, then cooled and rolled into balls. Once the mixture has been melted and cooled, you can hand over to the children – divide it between smaller bowls and let them add flavourings and taste to see what they like! For each batch of peppermint creams, you’ll need one egg, 250g of icing sugar, green food colouring, edible lustre, and a few drops of peppermint essence. First ask the children to separate their eggs – always a fun exercise! – showing them how to crack the egg gently, and pass the yolk from one shell to the other, while dropping the white into a large bowl. Next, ask the children to sieve the icing sugar over the top of the bowl – they could do this in pairs. One child can hold the bowl and stir the mixture, while the other shakes the sieve (gently!). When all of the icing sugar is in, the children should continue to beat until they have a smooth, rollable ball of icing. Now’s time to add flavourings and colourings – go easy, until you have the look and taste that you want. Finally, roll out on a board and cut out shapes. If you like, brush with a drop of water and sprinkle edible lustre over the top. Leave to dry overnight. These will keep in a tin for ages.